Excellent speedy service even during late night check in! The location of the property and the place where you pick up and drop off the keys is very close. Very hotel where you pick up the keys is close by. Modern look and very clean. Had everything we needed. Great location. 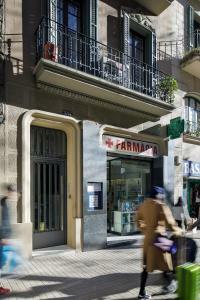 Very helpful personnel and the location is excellent with Sagrada Familia just around the corner. The metro and bus stations are close and there are dining options just nearby. The apartment itself was clean and well equipped. You can even cook if you'd like. Central location but no noise from the street! Great restaurants close by. Only one block away from a super market. Very clean. The kids love the bunker bed. The location was excellent. There were shops, restaurants, major tourist attractions and the metro station all within walking distance. When we picked up our keys, we asked for a good tapas restaurant recommendation and they gave us one which entitled us to a few free items at the restaurant. Would definitely stay there again. 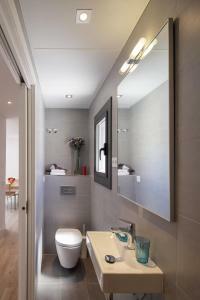 Great location; only a block from the sagrada familia and metro. Apartment was well stocked and nicely furnished. Lock in a great price for Hotel Sagrada Familia Apartments – rated 8.7 by recent guests! One of our best sellers in Barcelona! 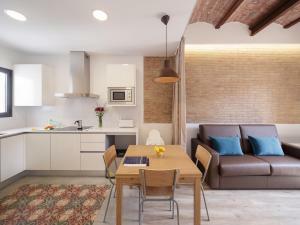 Set in Barcelona, Hotel Sagrada Familia Apartments offers self-catering apartments set 150 feet from Gaudi's Sagrada Familia. Sagrada Familia Metro Station is 3 minutes' walk away. 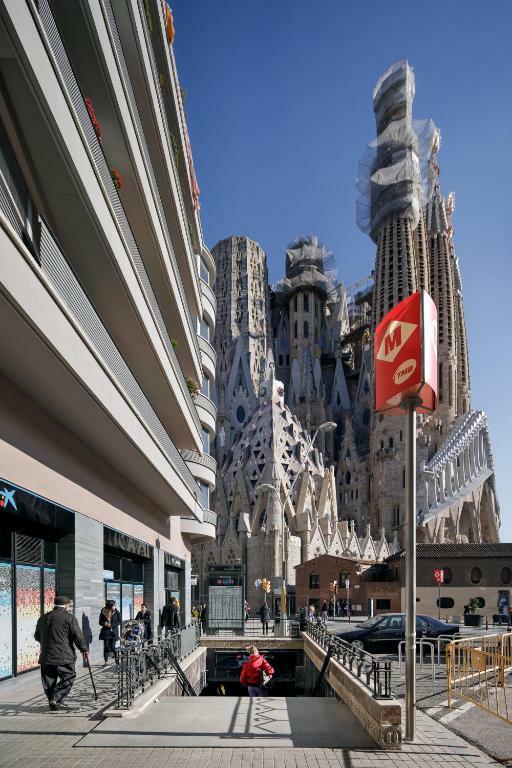 Gaudi's Casa Batllo and La Pedrera are 20 minutes' walk from Hotel Sagrada Familia Apartments. Barcelona El Prat Airport is 8.7 mi away. When would you like to stay at Hotel Sagrada Familia Apartments? This apartment features free WiFi and 2 bedrooms. The kitchen comes with a ceramic hob, microwave and dishwasher. The bathroom includes a shower and hairdryer. The living room has a sofa bed and safe. Please note that the apartments are not adapted for guests with reduced mobility. 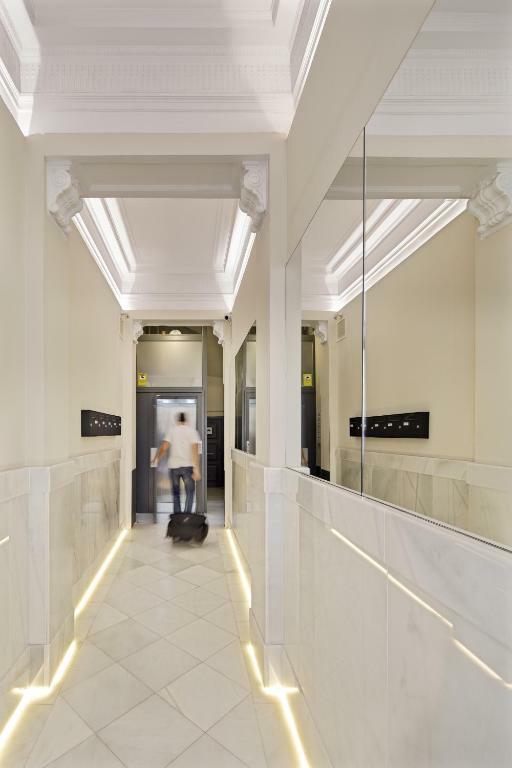 House Rules Hotel Sagrada Familia Apartments takes special requests – add in the next step! Hotel Sagrada Familia Apartments accepts these cards and reserves the right to temporarily hold an amount prior to arrival. Please note that check-in and key collection take place at: Còrsega 541, Barcelona 08025. The location was excellent, the apartment was perfect for 4 adults to share with plenty of room for all, very clean and well presented on arrival. The bathroom is very tiny and narrow, but it's not a significant detail that would deter me from staying there again. The location of the hotel was excellent. It is located near the Sagrada Familia and within walking distance of the subway, which makes it easy to travel throughout the city if you plan on taking the tube. When you open the window/balcony door, you will smell food from the restaurants around. Better to “air” the rooms early in the morning :-). I prefer sleeping under a cuvet, instead of blankets with sheets, but that’s personal. Great location, very clean appartement, nice lighting, kitchen very well equipped, beautiful “loft”style brick walls, laundry/dryer downstairs, view at Sagrada Família. The keys need to be picked up in the hotel two streets further. At check-out, just leave the keys in the apartment. Apartment is small, but well equipped. Great location, beautiful view from the balcony of the Sagrada Familia, near the metro station. Excellent quality versus price ratio. We had everything we needed to spend a week with our family. Excellent location, next to the Sagrada Familia. Not enough hot water for shower in the evening. But in the morning the hot water works very well. The apartment is very spacious and very well equipped. You have everything you need. There is also a washing machine and drying machine on the ground floor of the building. We also enjoyed a great view of the Sagrada Familia. A few things did not work out with the apartment. First the heating system was sending hot air in the living room and cool air in the bedrooms. We had to crank up the heat to make the temperature in the bedrooms bearable. That meant that it was hot like a sauna in the living room and that we had to keep all the doors open. We are used to living in cold weather but the heating system made our stay very uncomfortable, especially during the night. Secondly, the sink in the tiny bathroom was a little clogged. Considering that it was about the size of a sink of an airplane toilet, we had to wait for the water to drain after every few seconds of use.Then there was the wifi that stopped working after the first 24 hours. The heating and the internet issues were communicated to the receptionist but we only got a reassurance that someone would fix the problems the next day (after our check out). They should have fixed those problems without delay but judging from other reviews, they probably knew they could not fix them. They also made the mistake of telling us to wait for our taxi at the apartment and then called us at the last minute on our cellphone (costing us roaming charges) to tell us to go to wait at the hotel instead. To their credit, the person who called was very apologetic and polite, and we were glad that they notified us of their mistake, otherwise we would have missed our flight. Lastly, it felt strange that we had to take out our own garbage. Asking renters to keep the apartment clean is expected but shouldn't the apartment come with a very minimum of daily service since we are paying the premium of short term rentals? 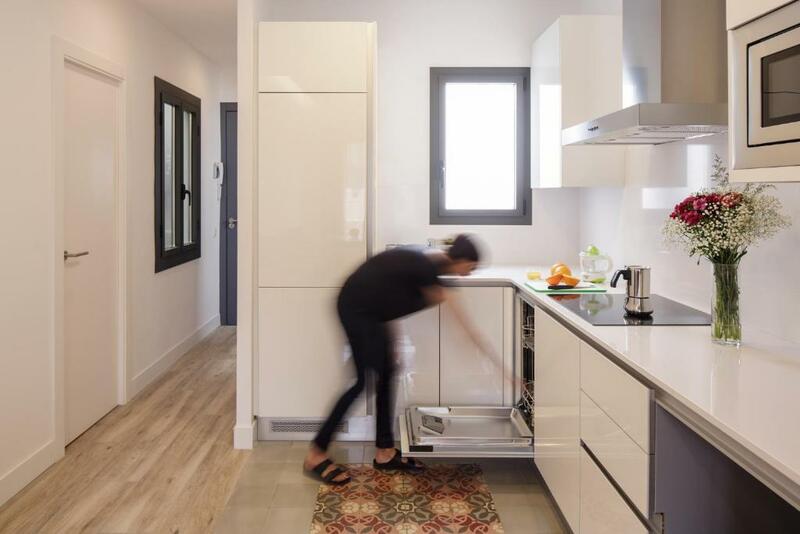 All the pluses of the apartment are important qualities but all those little discomforts, especially the heating issue, made it hard to feel completely satisfied with the entire experience. We will be exploring other options for our next stay in Barcelona. The location was excellent. 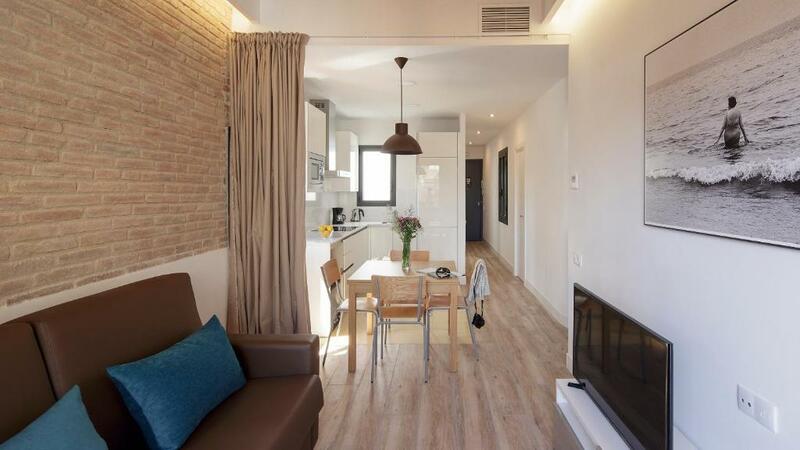 A few steps from the Sagrada Familia, the metro and many restaurants and shops, the apartment was ideally situated. The kitchen was clean, modern and well equipped. We had everything we needed to make our meals. The beds in the bedrooms were comfortable, even the sofa bed was not too bad. 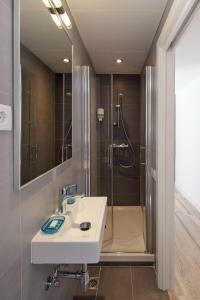 Overall, the modern design of the apartment was very appealing. We stayed in the apartment for four nights. We were cooking at night and electricity went out constantly, the reception call the maintenance to reset it, but it went out again. Every other hour I had to reset it, so annoying. I would not recommend to stay in this apartment.